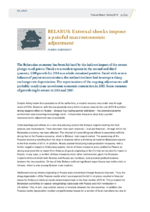 The Belarusian economy has been hit hard by the indirect impact of the recent plunge in oil prices. Thanks to a modest upturn in the second and third quarters, GDP growth for 2014 as a whole remained positive. Faced with severe balance of payments constraints, the authorities have had to accept a sharp exchange rate depreciation. The repercussions of the ongoing adjustments will probably result in an unwelcome economic contraction in 2015. Some measure of growth might return in 2016 and 2017.